In October 2010 I had a sinus infection and was treated with Levaquin. On the third day I noticed severe joint pain in my legs, the next day my friend who is a doctor told me to discontinue the medication. I took Aleve for the pain and it helped for a short time, but I have been dealing with this terrible leg pain for over a year now. Some days are worse than others, but overall the pain is debilitating and has had a major impact on my life. I am 46 years old, but some days I feel like I'm in my 80's. Everyday I regret taking Levaquin and will never take another "quinolone" ever again. In fact, I've suffered through several sinus infections over the last year and have only used OTC drugs and a sinus rinse. I can't understand why this drug is still on the market considering all of the people who have been negatively affected by Levaquin. Sorry to hear you've been injured by Levaquin. It's still on the market because A. The medical/pharmaceutical industry makes LOTS of money off it, and B. officially 'only' 1-3% of patients taking Levaquin suffer side effects. the Levaquin antibiotic attacks organs and brain and nervous system. Levaquin Tendonitis is something else entirely. 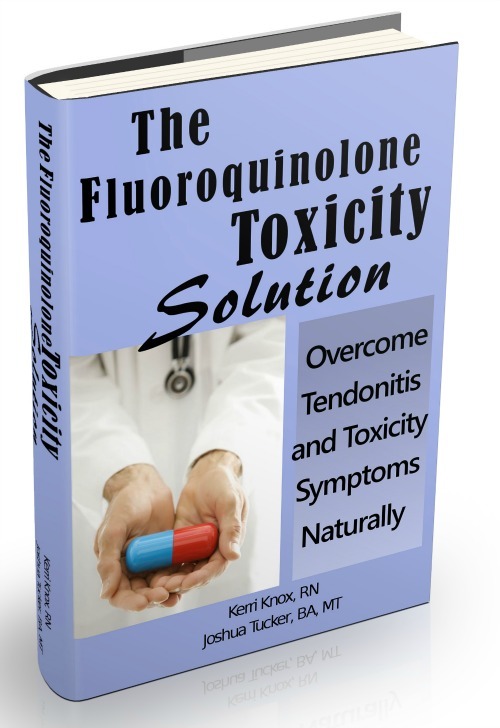 It's a GOOD idea for you to NEVER take Levaquin, or any other fluroquinolone again. You are clearly susceptible to the cytotoxicity it causes, and taking more would surely injure you further. What's up with those sinus infections? Something is/has been off in your immune system function. Of all the things I could say about that, make sure your Vitamin D level is up between 50-80. Vitamin D is a HUGE player in the immune system operation. Hello Gail. I'm sorry to hear about all that. Acupuncture and aspirin isn't going to fix anything, though it may help get you through the day. Levaquin massively depletes the body of magnesium (among other Levaquin side effects). That at least partly accounts for the anxiety and muscle pain and joint pain. It's likely it wiped out the good bacteria in your gut (as antibiotics do), which can account for the diarrhea. There's more to it that that, but you MUST deal with repleting your Magnesium and other nutrients and replace the good bacteria in your gut with probiotics. I highly suggest the The Levaquin Tendonitis Solution ebook and the forum that comes with it. You need a complete and thorough plan of attack. Time and rest will not heal Levaquin side effects in most cases. I can't believe Levaquin is the reason for my pain! Developed a sinus infection that needed add'l meds. When I finished my first prescription, (Z-Pak), I wasn't any better. I called my dr. who prescribed Levaquin. I had never heard of it but asked only if it was a sulfa drug (as I am allergic to sulfa). When I began the meds I didn't notice much until about the 4th day. My arms were extremely sore to the point of being unable to raise them without pain. My knees began to hurt much more severely than normal, and I could barely walk across the room without giving out. This continued to the point my family became concerned. I knew something wasn't right. I began to research and thought possibly I had lupus, RA, etc. I spoke with a lady today who had experienced the same things I had been experiencing. She is unable to walk without a cane. I haven't been able to do any of the "normal" everyday activities I am accustomed to. Last night, I noticed my lower legs swollen. This (the main Levaquin page) answers my questions as to what was happening to me. I will continue to watch to see if my symptoms disappear and if not, I will check back with my dr. Thanks for opening my eyes to this medication. Hi Lynn. You didn't leave an email address or check the notification box so I hope you find this. I'm sorry that you're going through all that. No fun. If you find this response, please give us an update on where you're at. I have horrible leg pain from Levaquin poisoning. 1. The entire leg(s), or part of the leg(s), or? 2. Cramping/spasm, or just pain? 3. Muscle pain or joint pain or both? 5. What are you doing for self care? 6. Have you read this entire thread, and the pages it links to? Wish I knew then what I know now about Levaquin for my sinus infection!!! I was a healthy active 41 year old who loved riding Dirtbikes, hunting, and fishing in south Alabama. I was poisoned by levaquin in January of this year prescribed for a sinus infection. After that I faired ok for a couple months but felt fatigued and was having anxiety than I pulled a major muscle in my back. I went to orthapidic and was givin steroid and flexeral and the same time I got another sinus infection and was prescribed levaquin 750 for 10 days after the second day my ankles started hurting, anxiety, crying, sweating could not sleep all kinds of crazy side effects so I call my doc and said I see were u should not take steroid and levaquin together could this be what is wrong? They said they prescribe those 2 together all the time and that I should stay off the internet. The Next day I went to my ent doctor he looked at the cat scan and said I needed sinus surgery and he could do it in 3 days June 5. The day of the sinus surgery I got home from surgery and after a couple hours I started to bleed heavy out of my nose and mouth which cause me to have a full blown panic attack. Call 911 and spent the night in hospital. 2 weeks after the surgery he prescribed me avelox 400 with a prednisone 20mg, after 2 days the side effect were so bad I stopped taking it. Now here we are 4 months later and I have had all kinds of symptoms and all kinds of test: Lyme, autoimmune and diabetics all negative. I have lost 25 lbs, I am weaker than I have ever been, shoulders hurt, elbows hurt, wrist hurt, bottoms of feet, ringing ears, dizzy spells, sensitive to light, some times stabbing pains in left shoulder. I have been seeing a naturopathic doc for 2 months who has me on strick diet and lots of good supplements. This is the craziest thing I have ever been through and I just want my life back. Sorry such a long post. Any tips on things that might help thanks in advance.ion. What does the ND have you on, nutrition-wise? I'm going to be it's not enough of some very important factors. 1. Next time you see your doctor tell yell at him/her for giving you steroids after Levaquin. Research clearly shows that that's a bad idea. 2. Your symptoms point mostly to magnesium depletion symptoms. THat's a primary aspect of Levaquin, it depeltes magnesium. Dizzyness, fatigue, ringing in the ears, etc, are magnesium insufficiency symptoms. 3. Maybe your symptoms reflect something more than magnesium deficiency. Let's hope not, but Levaquin is kind of like getting hit by a car. YOu get hit, the car drives off, and you're left with the repercussions. The levaquin is out of your system. You're left with the repercussions. One of which is magnesium depletion. There are almost certainly other factors at play, but that's a big one. The game now is to recover and get back to being pain free and active.